Buried at Croonaert Chapel Cemetery. FATHER AND ANOTHER SON STILL SERVING. The roll of Haslingden homes thinned by the loss in war of two sons is unfortunately having to be added to from time to time, and this week it is our painful duty to announce that Mr. and Mrs. J. Rushton, of 8 Granville Street, Helmshore, mourn the fall of two of their three soldier sons - Lance Corporal Barnes Rushton and Private John Richard Rushton, aged 18 and 22 respectively. The former died of wounds in France, and the latter, who was of the King's Own Royal Lancaster Regiment., was killed in action on the same day, June 7th 1917. The lance-Corporal worked at Park mill, Helmshore, enlisted on April 3rd, 1915, and went to the front five weeks ago. 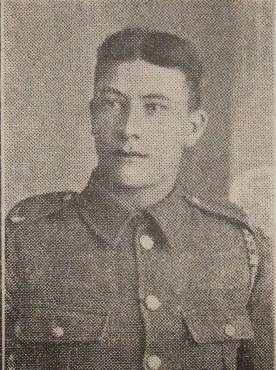 The private worked at Whittaker's, Helmshore, enlisted on January 4th, 1915, and had been at the front over two years. He was wounded once. Both lads attended Helmshiore Wesleyan Sunday School, and the elder was for several years a very popular member of Helmshore Conservative Club. Their father also worked at Park Mill, but is now with the Home Defence Corps guarding prisoners. Another son is with the colours in France. At Helmshore Wesleyan Sunday School on Sunday a service was held in memory of the deceased brothers. In sad but loving remembrance of Lance-Corporal Barnes Rushton; also his Brother, John Richard Rushton, who both gave their lives for their country, June 7th 1917, aged 18 and 22 years. And the loved ones they left at home." For the bravery they have done. Are the names of both of them. "Clasping their hands in the Better Land." And we'll wait at the beautiful gates for you." Ever remembered by his loving Mother, Sister and Brothers, also his Father and Brother (serving with the colours), 8 Granville Street, Helmshore. The hope to meet again in heaven." From his Sweetheart Agnes, 77, Bolton Road West, Ramsbottom.